Hello ... Hello ... my old friends ... It's great to see you once again! There are undoubtedly many fans out there who also appreciate the musical machinations of another highly successful act who often shared the charts with ELO during the Seventies: 10cc. It should therefore come as no surprise that their date on Wednesday 12th April in the finery of Birmingham's iconic Symphony Hall was a gig much looked forward to by Yours Truly KJS, especially with a support set by Iain Hornal also on the cards, fresh from his appearance with Jeff Lynne's ELO at their recent RRHOF investiture. Up first was Iain Hornal with an inspired seven song solo acoustic cameo which showcased six of the best from the excellent new Hornal album "The Game Begins With The Lights Out" (click here for album review) plus "Drop This Song". We look forward to now seeing Iain playing some live dates around the country with a full band in order to further enhance his growing reputation. Having worked with both 10cc and Jeff Lynne's ELO, Iain's entertaining set was a perfect stepping stone in advance of the arrival of Graham Gouldman and his 10cc troops. "... one of the most memorable concerts that I've had the pleasure of attending." 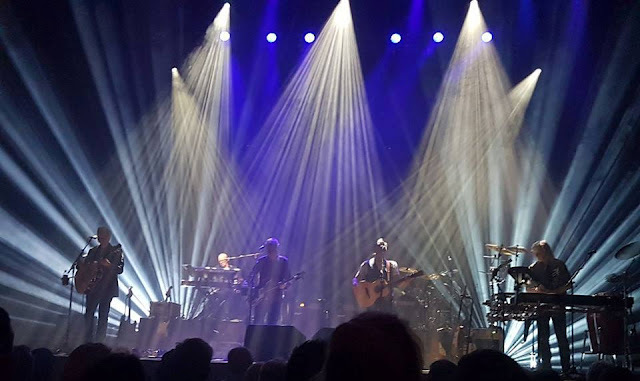 Next up were, of course, 10cc - and they did not disappoint the full house with an exemplary performance of not only their famed hits but also some of their legendary album tracks. 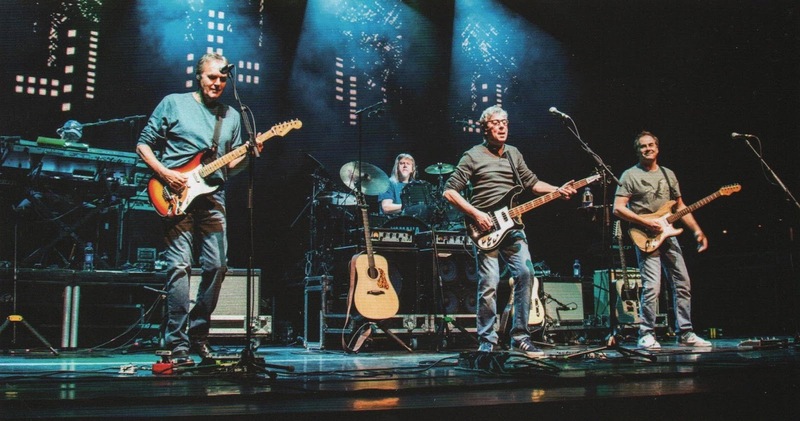 This was truly a polished and professional show by songwriting legend, guitarist and bassist Graham Gouldman and his band, who not only succeeded in bringing their audience to their feet but also genuinely enjoyed themselves and their talents too. The sublime guitar craft of Rick Fenn and keyboard wizardry of Keith Hayman alongside longtime drummer/percussionist Paul Burgess (and a virtual Kevin Godley) were the perfect vehicle to deliver what was one of the most memorable concerts that I've had the pleasure of attending. The links between 10cc and ELO were strengthened by the presence of Mick Wilson, who was also on stage with Jeff Lynne's ELO for their 2014 Hyde Park spectacular (click here for review) with the vocalist and multi-instrumentalist on top form with his soaring vocals a real highlight. Their eighteen ong set included a magnificent full length rendition of "Feel The Benefit" and, aside from their huge array of hit singles, "Old Wild Men" and "I'm Ready To Go Home" were also impressive. Hearing a pitch perfect "I'm Not In Love" was a fave moment but their wonderful a cappella take on "Donna" surely ran it close. I'm so glad that I was one the 2,263 folks who witnessed this 10cc musical masterclass from the heady heights of the Grand Circle. Truly an awesome gig in the truest sense of the word. Next time they tour ... go see 'em! 10cc performed: "Wall Street Shuffle" ~ "Art For Art's Sake" ~ "Life Is A Minestrone" ~ "Good Morning Judge" ~ "The Dean And I" ~ "Old Wild Men" ~ "Clockwork Creep" ~ "Feel The Benefit" ~ "The Things We Do For Love" ~ "Silly Love" ~ "Somewhere In Hollywood" ~ "Baron Samedi" ~ "I'm Mandy Fly Me" ~ "I'm Not In Love" ~ "Dreadlock Holiday" ~ "I'm Ready To Go Home" ~ "Donna" ~ "Rubber Bullets"
Iain Hornal performed: "Drop This Song" ~ "Different Places" ~ "Say The Word" ~ "Quit You" ~ "Running Away" ~ "Jennifer" ~ "She Doesn't have Anyone"
elobeatlesforever (elobf) recommends 10cc and Iain Hornal to those enlightened folks who enjoy the music of ELO, Jeff Lynne, Roy Wood, The Move, The Idle Race, 'Brum Beat', The Beatles and related artistes. including Kevin Godley's appearance and the brilliant a capella Donna - and was equally impressive. Only criticism was that it could've been a tad louder but then GG's 98yo mother was in the audience so can forgive that! I never tire of listening to 10cc or seeing them live, the musicianship is second to none, Mick Wilson is a great in his own right, roll on next tour!! Had the pleasure of going to the Palladium show the following day and yet again they didn't disappoint. The show shared many of the components from last year's awesome Sheet Music tour (Kevin Godley's vid appearance, the brilliant a capella Donna, as well as some of the links) but was no worse for it. Only criticism was that it could've been a tad louder upstairs but GG's 98yo mother was there so that can be forgiven! Never tire of watching 10cc, we would all love to see the classic lineup but these guys do it so well it matters not. Paul & Rick are as good as ever and Mick Wilson is simply amazing. Roll on the next tour!! I went to see 10cc at Symphony Hall on 12th April, on a whim, having recalled I liked I'm Mandy Fly Me etc. when I was 10 and having one of their Greatest hits albums. I was unprepared for the sheer delight at hearing 10cc music live. It was life enhancing / changing: the best live act I've ever seen (I'm too young to have seen the Beatles!) I say to anyone reading this: Get the first 6 10cc albums: every track is brilliant:the band were witty, clever, memorable, funny, unusual and ground breaking. If ELO are the son of Beatles, according to John Lennon, then 10cc is surely the younger brother?! We got there late and so missed Iain Hornal: it dawned on me after that he was the main, powerful and beautifully complementary male vocal to Jeff's when I saw ELO in Brum the previous June. He (and Ciaron Jeremiah) ably assisted Graham on his HFoS tour. Iain's album is pretty amazing: I listen to that as much as all my 10cc stuff. Hope you don't mind me adding the sampler? https://youtu.be/awmn-bTOr3w . Oh and Iain's pal Paul Canning also shared the support act role for 10cc last year, check his new album out too. Both Iain and Paul took their turn in playing Macca and John in the Beatles music: Let It Be.